So much for that global “free” market. So most commentators are comparing the wrong type of carbon credits, and the Australian market is even more overpriced than people recognize. Australians will be paying 500% more than the largest carbon market in the world. The Australian scheme is the most expensive, and most ambitious in the world. On top of that we are a distant market based heavily on fossil fuels. LONDON, July 16 (Reuters Point Carbon) – CER prices sank to a new low on Monday within touching distance of 3 euros as traders continued to offload the offsets amid plentiful supply of cheaper ERUs, which can also be used for compliance in the EU’s Emissions Trading Scheme. The benchmark December 2012 secondary CER contract closed at 3.18 euros, the day’s high, but down 2 percent on Friday’s close as traders continued to unwind long positions. In afternoon trade the U.N. offset slid to a record low of 3.08 euros. “The feeling is that with increased ERU supply coming into the market, there’s not much reason to hold onto CERs, particularly because of oversupply in the carbon market as a whole,” said one trader, adding that 3 euros was a critically- important support level. Natural gas prices are falling, so electricity producers are switching to the cheaper and lower emission fuel, which means they don’t need to buy as many carbon permits. As I’ve said all along, those who call for a “free market” solution are the ones who don’t know what a real free market is. The Climate Spectator confirms that it is the CER price that the Australian and New Zealand schemes are tied to. Well, thats it then. Im moving to the EU. Obviously a can of coke must be much cheaper in the Eurozone. It’s full of CO2. Can we sue this Federal Government for sending us down the toilet tube with no end in sight. How anyone can believe anything that this PM, Combet or Wong says is beyond me. I believe it’s time for a revolution!! …then how about a game of Two-Up ?? I win, no more CO2 Tax, If Team Smith wins, no more Oz. Usually the more a party employ’s clever advertising for a product, the more chance they have of attracting buyers. Here we have a product that the harder they push the less buyers they can attract. Tell me again Julia, why are we following a failing scheme? Even worse why are we hitting the after burners, scorching the earth as we rush to the head of the pack? Once upon a time, two young women, called Helen and Julia, went to a career counsellor for some advice. They were told that it was not sufficient to be highly competitive in the jobs they held at the time, they also needed to position themselves as the ideal candidate for the next job they wanted. Good advice for anybody, you might think. So Helen and Julia stuck to that philosophy throughout their careers, and found that it stood them in good stead, and both ended up being highly competitive and in charge of successful trading enterprises. But what were the next jobs they needed to position themselves for? What jobs would give them more power than they currently held? Well, Helen set her sights on a top job with an international organisation, that would give her tremendous power, and because of her loyal record, was seen as the ideal candidate for the job. Julia, on seeing this, was determined to follow the same route, and set about positioning herself to follow her long time comrade, Helen, into a sinecure in the same international organisation. Whether she was successful, or not, will have to wait for another story, at another time. if the CAGW were not a supranational scam of the highest order, then countries like our would have Opposition Parties screaming this info all over the MSM. if the MSM were not complicit worldwide, Jo would have been hired to write at least a weekly colummn, or host a weekly TV show, to expose the scam in a way the public could easily understand. if the Unions were not completely corrupted, there would have been hundreds of thousands on the streets of all major Cities long ago. “The last dark deed of the Howard Government was the passage of the National Greenhouse and Energy Reporting Act in October 2007. That act is the auditing basis of the carbon tax. That is the part of the Howard legacy that many of us have toiled mightily to avoid. That legacy is now with us, and we stare into the abyss of a continually shrinking economy. Great link from Val, & worth a second post incase it was missed. The unions were not so corrupted…. Who would fill the $150,000 a year board position on Union Super Funds for 3 hours a week ?? My hope is that Tony Abbott will be thoroughly jesuitical when in power. Not only might he abolish the tax/price/ETS (ignoring the complexity and impossibility of doing so till he has done it), he should do a double-Merkel and spend most of his enviro-billions on modernising coal power, describing the initiative as twice-green because it’s more efficient and sparing of coal, and also because it’s a transition to “clean energy”. (As to what that will be, make something up. Just don’t call it Solyndra). Those concerned with modernising our coal power generation will be deemed to have “green jobs”, as will those who run our modernised generators. Even those who make glossy brochures promoting New Coal will likewise be deemed to have “green jobs”. Malcolm Turnbull can be Minister for Doctors’ Wives…and that can be a “green job” too! Luckily, I have this sneaking suspicion about something. Macquarie Generation owns Bayswater. They have plans in for an upgrade to USC pulverised coal, replacing their four units with new tech coal fired units from the feed to the generators, and every step in between. The choice is that or Natural Gas units. The natural gas fired units would be infinitely more expensive, and produce less power, and not have the life span of the coal fired plant, because they will have to instal gas pipelines from, well, from wherever, most probably Queensland. The new tech coal fired would be replacing one unit at a time while the others keep burning and turning. They tried to do it under the previous Labor State Government and you can bet the Feds placed more restrictions in their way. I have this hunch that they are just waiting for the Federal Poll and if the result is advantageous, then there might be a go forward. That being done, then maybe the nearby Liddell may (just may here, also a gut feeling) also go the same way as well. Bayswater is almost 30 years old, and Liddell is 41 years old, both owned by Mac Gen.
Mount Piper may also go ahead as well. Due to the age factor Bayswater and Liddell have lowering Capacity Factors, well so would you having been run flat out for all that time, and their CF could be as low as 70%. New tech coal fired such as proposed here can run at around 87.5% CF. So, in effect you will have considerably more power from larger output generators, and considerably less emissions as well. Admitted, a hunch is just that, a hunch. In the interim, look at this chart, and be a little worried. Are you seriously suggesting we might start to catch up with what China has been doing for a decade or so – i.e. move to more efficient coal? Yep, having a price on carbon is an amazing thing. It forces businesses to think again about energy efficiency either at the production or consumption ends. So you like to “force businesses”? And to think again not about energy efficiency but overall efficiency, overall costs and ultimately to consider locations that will effect better profits. This includes relocation to other countries, eliminating marginal offerings, and with that eliminating personnel. Again Adumb, you are oblivious to the real effects of this “amazing thing” you have permitted to come to fruition. You won’t know how expensive this will become for several months and probably up to several years. By then the damage will be irreversible with business closings, relocations and unemployment. Additionally, you’ll see higher food prices which will be most happily welcomed by the lower classes. Your mineral exports will become more expensive compared to other nations. All this you happily wish upon your fellow countrymen and for what gain? Again, to “force” your businesses is NOT the way to prosperity, neither taxing your way to prosperity. Adumb, I hope you sleep well. Obviously Adam is oblivious to any sort of professional Engineering principles. These stations would probably have been upgraded before this (or plans for doing so finalised) if the politicians and regulators had just let them get on with it. Now of course it is government “policy” that is responsible. Policy that did not even exist prior to the last election. “There will be no carbon tax … “. Were you aware that they shoot turkeys in America? You fool – a move to more efficient generation is something they want to do because it will allow them to either offer power at a lower cost, or sell the same amount of power and make more money. You don’t need a synthetic carbon dioxide ‘price’ when there is already a spot electricity price – a real price determined by real demand and real supply. Carbon Tax lovers fail to realise that these things would already have been done, were it not for the ongoing and continuing uncertainty at what stupid government scheme is going to be erected in front of them. If the governments just let them be, they would be able to upgrade the generators, produce more efficient power and let the benefits flow through. But instead the central planning fools try and erect bird choppers instead, upsetting everyone but distant idiots who think they are saving the planet. It’s very easy to identify an idealogical fool with no grasp on reality – just look for a person who thinks a carbon dioxide tax is a good idea. It also forces businesess to think of subversive new ways of gaming and defrauding the carbon tax system. Just give them time, they’ll be doing it beofre the years out. Peter, Tony is more knowledgeable than I on these matters, but my understanding is that China’s transformation of its coal power is related to its unwillingness to waste money and coal by burning the stuff in aging clunkers. However, I am not a very deep thinker, so this could be a mistaken impression. I note that in recent times China has announced that it is contemplating a carbon price/tax of 10 yuan, about $1.52. There is no price, just contemplation. In fact, there may be no contemplation, just announcements to that effect. If this leads to modern, efficient coal power generation, I suggest we abandon present policies and announce to the world’s sophisticates, luvvies, Guardian readers etc that we are contemplating a carbon price of $1.52. Just contemplating. Or just announcing that we are contemplating. China is not replacing old clunkers. It had no power. Barely 4 years ago, only one family in ten had access to electrical power at all, let alone constant and reliable power we take utterly for granted. China in its rush to industrialise has started from virtually scratch, and is ramping up power plant construction of every variety, not to thumb its nose at the environment but to actually provide power for that ramping up of industrialisation. While here in Australia, the power mix is 38% residential, 37% commerce and 24% industrial, in China, almost 80% of all power being generated goes to Industry. The fact that people are at last getting access to electricity is a by product of all that power being constructed for Industry. Because they started from scratch, virtually all their plants are new and state of the art. They have some old plants, but it’s almost got to the stage now where they are not needed as so much new power comes on line. Even now barely one family in five to seven have power and even then it’s nothing like we think of residential power. Why construct clunkers when you can build all new stuff. Here in Australia, Companies have actually attempted to do just that, replace old clunkers. Labor, both at State and Federal level have done nothing except place obstacles in their way. There’s no point whatsoever even considering new technology coal fired power here in Australia with this current regime in charge. They are doing all they can to see that this sort of technology is something that Australians do not ever see. new tech Coal fired power is designed to operate at maximum efficiency, and that is at a CF of around that 87.5%. Why would you even bother to consider new tech coal fired power when the ETS means that the CO2 emissions cap is lowered each year. The only way that can be achieved is to generate less power, and less the following year etc etc. It’s cheaper to run the old plant into the ground, as its CF is lowering each year anyway through aging factors. Those older plants emit up to 17 to 22% more CO2 than the new tech, but there’s absolutely no point even considering a new plant. That’s where the ETS fails so miserably. It stops new development cold, and there’s nothing to replace that level of power with. I think you should spell out the emission savings to make it obvious (although not to A. Smith). Brown coal plant at present – 1300 kg CO2 per MWh. Newer technology plants coming on line – 760 kg or less. This means that merely converting our brown coal plants to black would reduce emissions by MORE than a practical amount of wind turbines could ever deliver. Switching to current or newer technology would be far more effective in reducing emissions, and at far a lower cost than schemes involving wind turbines. Unfortunately, the current federal “government” is being led by the nose by the Greens, who are obsessed with wind turbines (and solar) and not at all interested in actual reductions in emissions. the problem I see with converting those brown coal fired plants to USC black coal, while attractive has the inherent problem I mentioned in an earlier Comment in another of Joanne’s Posts at this link. That is the fact that most of these large scale plants are built at or close to the site of the actual coal mine, and any conversion would entail getting that black coal to the plant, which I explained at that link. Now, if they had a similar type of plant for brown coal, then that would be an attractive option, but really, any coal fired plant of any sort is out of the question in this current situation. Tony, if you are still here, I’d love to know what you think of the efficiency claimed (and not disputed?) for the quite new coal power facility at Datan in Taiwan. Even those who angrily monitor such things give it an intensity rating (kilos of CO2 emitted per net megawatt-hour)of under 450, compared to Bayswater at about 1,130. It’s seriously big, and uses 12 sets of highly efficient, corrosion-resistant, low maintenance centrifugal water pumps giving an efficiency of 89%. Of course, Datan have also installed about three whirlygigs somewhere, because Asian power companies have noted that Malcolm Turnbull and the Fairfax-perusing classes are impressed by such things, and see them as a promise of “Asia taking serious action on climate etc etc.” But I was wondering how a utility like the smart, new Datan coal plant measures up against our rickety clunkers in terms of final efficiency. I’m not sure about that Datan plant being coal fired. The only information I can find is that it is a Natural Gas fired plant, and this one is a Combined cycle plant. An open cycle plant uses a gas fired turbine which drives the generator. The gas fired turbine is similar to (a gross simplification here, but you get the general idea) an aircraft jet engine. A combined cycle plant is the normal gas turbine, only instead of the superheated exhaust venting to the air, that heat source is used to boil water to steam to drive a smaller turbine which in turn drives a smaller generator, effectively giving two methods of power generation from the one source, as shown in this simple schematic diagram. An open cycle plant has a thermal efficiency of around 40% while a combined cycle increases that to around 60%. While this seems attractive, these types of power plant have shorter life span than coal fired plants due to the nature of the turbine itself. They can be utilised for the provision of a Base Load requirement, but new technology coal fired power is much more robust and has a projected longer life span. Open cycle gas fired plants are typically used for peaking power operation, eg a few hours a day to top up the grid at those times of highest consumption. A combined cycle would be best used for longer periods of time mainly because of that second function here, but again without the longevity of coal fired power. Your CO2 emissions percentage might actually lead me to think this was a NG plant. On a Watt for Watt basis, NG fired plants emit around 35 to 40% of the emissions from a coal fired plant. Coal fired emits on average 2.86 tons of CO2 per ton of coal burned, and a NG plant emits 122pounds of CO2 per mcf (thousand cubic feet) of NG burned. Post Script: With respect to large scale coal fired power, have a look at this list of Power Stations with a capacity greater than 2000MW, (typical large scale Coal fired power plant size) Note how many of them are in China, and also note that most of these have com on line in the last 5 years. I notice that Mailiao, which is a Taiwanese coal plant, has an intensity rating of about 850. Would that translate directly into proportional savings over the 1,130+ of an aging Bayswater? Upper reaches of possible real savings? It seems a huge difference, and I’m sure it’s not that simple, but it’s certainly interesting. While the efficiency of Datan did seem too good to be true, I keep wondering to what degree better design and materials are likely to contribute to fossil fuel power, as well as nukes. Living in coal, gas and uranium rich Oz, I’m liable to think these thoughts often! Also, looking at the high-design features of Datan, I wonder if more can’t be done for the longevity of gas-power plants. Sorry to plague you with (possibly repetitive) questions, and to use Jo’s site for the purpose, but it’s not quite O/T and I do find your thoughts on electricity very valuable. Oddly, accurate and detailed information about (any) Chinese coal fired power plants is difficult to find. It’s a matter of chasing up the correct name for the plant, finding that, then translating the page and then distilling the information. I’ve even tried the difficult to access China Power Portal, and doing the same thing, but again, information is hard to find. (hey, surprise surprise) However, I just keep looking. The information Graeme No.3 has above in Comment 4.1.1.2.3. is good information regarding emissions savings potential shows the dramatic savings. Now, while I fully support Nuclear Power, that is but a dream that is a long long way off yet. They would have to bring the public along with them, which of itself would be a very long process. Then you would need political will, and then legislation. All that being in place, it would then be ten years before any plant might actually be on line and delivering power. So many factors need to be in place for all this to eventuate. Some could say that we could import the fuel in the form of the rods themselves, but it would be a better idea to have that processing and manufacturing ability here in Australia, and then, at the same time, we could have the debate to go down the path of reprocessing the fuel for subsequent re-use, and again, with all of this we are talking a long long time, and the public debate is not even on the horizon yet. In the interim new tech coal fired power would tide us over, as those old plants will have long time expired by then. I would guess that you have seen my Series on Nuclear Power at the site where I contribute, but if you haven’t, here’s the link anyway. Nuclear Electrical Power Generation – Why The Fuss? Even our Green Betters should be impressed. After all, if we’re going to fill the world with whirlygigs and solar panels, we’re going to need lots of coal power to manufacture the useless junk. Also, dismantling and scrapping will require lots of good fossil fuel power. That USC savings with reference to Bayswater falls neatly into the 15 to 22% emissions savings written into that 2011 report commissioned by the Federal Government. If they can get the same from Brown Coal, then it’s almost a no brainer really. The real pity is that to do something like that, you will need widespread public acceptance of just what this technology can actually provide. Let’s look at it then. With USC Black coal and this brown coal technology you are looking at an average emissions cut of around 22%. If electrical power generation makes up 40% of all emissions, then conversion of these plants to new tech results in an overall emissions reduction of 9%, which places the 5% by 2020 target into sharp relief, just with current proposed measures. The problem there is the desired further reductions that they want over the years. They will however sink billions into Wind and Solar. I think you’re being too optimistic. Mac Gen require investors before they can build new plant. 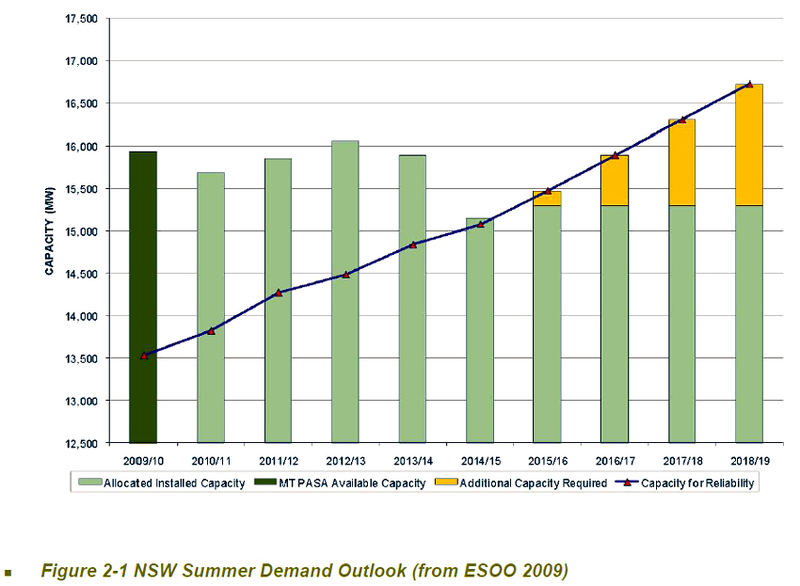 Investors will see a feeble NSW govt and a Tony Abbott who is not really committed to removing cost impediments (he’s retaining the disastrous RET). There will be no investors. For those who think the carbon tax is encouraging new technology investment by Mac Gen, nothing could be further from the truth. Mac Gen has had plans for new plant for many years, but they can’t find the money because of disastrously wasteful green idealism which is forcing money into garbage production facilities such as wind farms, and new bureaucracies. Uber, you are quite right. So I’m not contradicting you. It’s just that booting out Greened Labor is a tentative first step. The Greens are no longer regarded by the wider public as good but unrealistic. They are now seen, rightly, as destructive self-loathers and misanthropes. Ms Gillard said the debate was fast and furious. “I’m under no illusions … that carbon pricing is not popular,” she told ABC Radio on Tuesday. BEYOND the heat and anger of the carbon tax debate, there is an unspoken truth emerging in Australian politics – we are on the verge of handing power to a leader with whom we disagree on just about everything else. Two weeks into the dreaded carbon tax and there is no letting up from the PM-in-waiting Tony Abbott’s national high-vis offensive, from workshop to meal-room decked out in hardhat and neon to warn of the scourge of Labor’s poison. The script is simple. Find a friendly employer, line up a picture opp with a slightly bemused workforce, capture 30 seconds of vision and the key messages of “Big New Tax. Lie. Boo!” is packaged in pictures for the evening news. And that’s the unspoken truth of this drawn-out carbon death march. Look at the bigger picture and when it comes to policy the emperor has no clothes, or in Tony’s case, no high-vis jacket. meanwhile, with CAGW advocates Fairfax supposedly moving further towards online publishing, where allegedly the future lies, we have Murdoch media censoring Bolt (i’m no fan, but he had the most visited political website in australia, from the figures i’ve seen) out of existence, and Clive Palmer suggesting he would employ Fairfax CAGW hacks if he starts up an online newspaper!!! meanwhile, jo struggles along on her own, with a little help from those readers who are in a position to assist. JULIA Gillard did not lie to us before the last election. A lie is a deliberate statement of a falsehood. The liar is very conscious of the misleading nature of what they are saying. Then came the election result no one foresaw. Ultimately the price of winning government with the support of the Greens and Independents was a price on carbon. Gillard, ever the pragmatist, changed her mind and broke a promise. The circumstances had changed, or as Tony Abbott himself has been heard to note, “s— happens”. That it has persisted for so long and spawned the meme “Ju-liar” (a term used only by the ignorant, boorish and spiteful) says more about Abbott’s guile and ability to manipulate the facts for his own destructive ends than it does our Prime Minister’s trustworthiness. You’ve heard all the lines, ad nauseam no doubt – “this toxic tax based on a lie” – all of it in itself is a falsehood, made even more brazen, given Abbott’s self-declared “weather-vane” stance on the issue. And if Gillard is somehow deserving of the tag of untrustworthy for changing her position on the carbon-pricing issue, then what of Abbott telling SkyNews in 2009 that “if you want to put a price on carbon why not just do it with a simple tax?”. as we on this website know, the Kelly/Shanahan interview was published on the eve of the election of 21 August 2010. very few Australians would have even been aware of this article or Gillard’s new and ambiguous stance, which still says she rules out a carbon tax! Stop trying to apologise for the lying PM. What she did was five minutes before the election quietly admit that she intended to put a price on carbon anyway after expressly ruling it out. Her tactic was extremely devious in admitting it in an interview which was too late to be read (and responded too) by the vast majority of voters. In the interview she admitted that she would still price carbon another way – other than a carbon tax (ie an ETS, and then try to claim that it is something completely different and that she technically didn’t lie.) Only a devious and immoral slime-bag lawyer would stoop so low and assume Australians are all stupid. As the lady in QLD shopping centre said ‘I’m not stupid’. The only difference between a carbon tax and an ETS is that the ETS is a variably priced carbon tax. It is designed to only move within a strict range – with a floor price and the administrators of the market can set the price by changing the amount of permits issued and how many businesses have to buy them. Permits will be bought from the European carbon market which is able to set prices by changing the amount of permits issued also. This is not a free market – it is a variable tax – within a limited range and so is no different than a carbon tax. In case you can’t work it out – the political appeal of a carbon tax for the next 3 years is that it provides certainty of tax revenue so that Julair and Wayne the Goose can manufacture a false surplus and pork barrel union dominated businesses and marginal electorates right before the next election. So the ignorant thieving socialists are creating a ‘market’; need I say, that this will not end well. Polluters will still be able to surrender one New Zealand Unit (NZU) for every two metric tons of carbon they emit, according to the Climate Change department’s website. That means emitters can effectively pay a fixed price of NZ$12.50 ($9.88) a metric ton for two permits, or buy NZUs on the open market, where today’s spot prices is NZ$6.10, down from as high as NZ$8.50 on Feb. 28. Won’t Australian businesses only be able to use these CERs when we have a trading scheme with a fixed floor price of $15/tonne? Yes, I expect so Mattb, (See my update) – so until then we’ll pay $23/t while the EU pays $4. Lucky lucky us. well that’s because their market has allocated too much carbon meaning there is no demand. I have to pay $4.50 for a coffee that my mate in Melbourne pays $2.80 for… that’s markets for ya. At some stage with a global market we’ll all pay the same. dare I say it that websites like this mean that date is further in to the future than it needs to be. Mattb, we’re not buying coffee, or if we are, it’s a global coffee that most other people are getting for free. I look forward to the day when carbon is a true free market and the same price globally – $0. Not going to happen Jo, especially when you’ve got big US states like California and New York starting up ETSs next January. Of course the EU carbon price is very low, that’s because the EU is in either in recession or very close to it. Well, that is far from settled. California faces a number of legal challenges (thirty something last I heard), so the litigation could go on for decades. A search on legislative filings in both New York City and New York State, only show a filing for Vehicle Emissions testing legislation. So I would be interested to get a reference. Carbon Jo? Is that graphite carbon or diamond carbon? Seems like you are brainwashed too. In reality Jo, a carbon credit has at least the marginal utility of a government or central bank credit, they are after all the same thing. I’m looking forward to the day when a carbon credit is several trillions of $ & 0oz of gold. Of course, civilization will have gone to waste by then, but, such is the penalty for mankind’s hubris in attempting to build a tower – of debt – that reaches the heavens, for considering ourselves Gods – that can even change the weather. What happened to the Chicago Climate Exchange? You seem very confident in your ability to predict the future – so certain you are. BTW: What’s the definition of Hubris? The head of the European Carbon trading market has said that unless it gets a massive bailout then the whole trading system is doomed. Perhaps the head of the European carbon trading market should suggest the EU subsidise the trading market. They could call it a ‘progressive free market’. Spot the one country that has the supposed financial capacity to bail out the European Carbon Trading Market, and yet Germany is up for massive expenditures due to it’s Commitments to the Eurozone. What commentators such as Adam Smith don’t appear to have realised is that the developed world is drowning in debt, while governments and central bankers pile on more debt in the vain belief that it will somehow cure their broken economies. All the carbon trading schemes are, as malinvestments, going to be unwound (closed, shuttered, bankrupted, shutdown, etc) as the market violently corrects as the unsustainable debt mountain deleverages and the market reverts to a mean that covers off the last 30 to 40 years of credit fuelled fake growth. At some stage with a global market we’ll all pay the same. If only. Global markets still have international, regional and local distribution and storage costs, so the further you are from the point of production, the more you will pay. Even in the USSR, with a mandatory pricing structure, a loaf of bread bought in Moscow, would cost four to five times what a similar loaf of bread would cost closer to where the grain was grown. well that’s because their market has allocated too much carbon meaning there is no demand. Mattb – but that’s where the entire plan comes unstuck. Who regulates the demand and supply of the permits? It’s the government who does. They decide how many certificates are needed (the cap) and they also decide how many certificates that will be printed and given away for free (such as in ‘trade exposed’ industries). Now, what other market trades on an entirely synthetic item that has no basis, and can’t be measured. The closest market is the forex market. The supply of dollars, pounds, pesos and yen is determined by how many the government likes to print. Occasionally, a government goes nuts and overprints and destroys their currency (Zimbabwe, Argentina, etc). But there are real costs to the people for doing this, so governments try to only do it a little bit. Contrast that to printing carbon credits, or changing the cap. There are real benefits to the country for doing this, and virtually no costs. Indeed, if one government oversupplies permits, it damages the industries of the other countries who have to keep up their supply. So you have a situation where a government can benefit it’s own industries by oversupplying free permits or by lowering the cap. There’s an incentive to do this, becuase just like currency printing, the first one to do it gets all the benefits. And, by doing this, they incur zero costs to their industry, because they don’t have fixed debts in carbon credits. In such a situation, what do you think eventually happens to the price? That’s right, it goes to the same place of anything that is freely created and has zero real demand. It reaches zero. The entire scheme is doomed, and has been right from the beginning. The price trajectory of every single carbon market has followed the same path because of the in-built fatal flaw. Anyone who thinks this is a good idea is just an idealogical zealot who cannot use reason and critical thinking because of their desperate need to believe in the fairytale of carbon (sic) trading. A market managed by government drones – what could go wrong? Yes they can trade it down to $15/tonne (once it becomes an ETS) even if the Government is compensating people for a $30/tonne price. If that happens, which to me seems likely if it gets to an ETS, will raelly be bad news for the Government. Ok but what happens if the EU market for CER crashes due to lack of interest where do Australian companies buy their credits? Crakar – surely it is your wildest dream to have a carbon price approaching $0 per tonne? I mean so long as the total supply of permits = sustainable emissions then what’s the problem there? none whatsoever. $0 is the CORRECT price !!! I have many wild dreams but carbon taxing is featured in none. I once daydreamed that the tax did not exist does this count? No, a wildest dream is one in which the entire concept of carbon trading is placed in the same dustbin as eugenics and other failed theories. A wildest dream is one where the world collectively awakens from this madness and says ‘even if this science is true, which is by no mean certain, this idiotic synthetic trading market, ripe for fraud, abuse and scam, is doing nothing at all to prevent co2 emissions. We should scrap it now, dismantle all the bureaucratic nonsense it has spawned, and let people get on with their lives’. If co2 proves to be a problem, then some enterprising soul will come up with a solution. GIven that all the tipping points have already gone past us (2000, 2005, 2007, 2009, 2010,2012, 2020) there is no reason to worry at all. Even relocating entire cities, or building sea walls around them would be cheaper than extending a co2 emissions price to the $100+ per tonne it needs to be for non-workable renewables to even start making sense. Not one single invention in the history of mankind took off because a cheaper and better competitor was nobbled by government taxes and regulations. NONE. Australian companies will have to pay the government for the difference between the credits they buy and the floor price. ‘It’s a free market’ the brainwashed woolly thinkers cry. Yeah, right. A free market with a floor price? Now, tell me what happens when there is a floor price in a market? Correct Answer : either the market stops trading or there is significant oversupply, which always leads to a price crash. You cannot conjure markets up out of free air. Anybody trading in a market with a gun in their back is not trading in a free market. The market will cease to exist the moment the guns are taken away from peoples backs. It is not, will never be, cannot be, a market in the proper sense of the word. The “Free” in Free Market = Voluntary. I.e. I volunteer my labour by choosing my profession/trade etc. I voluntarily choose what goods and services are best for me within the market, I voluntarily engage with others in the market to make, buy, or sell goods and services, etc. It is the voluntary aspect that is destroyed by Governments, Cartels, Monopolies, and Special Interests practicing Regulatory and Legislative capture to entrench competitive advantage and destroy new competitors entering the market. By Bill Gunderson, president of Gunderson Capital Management Inc. in San Diego. He is also the host of the “Best Stocks Now” radio show, and the creator of the Best Stocks Now app. I shorted First Solar, America’s largest solar manufacturer. The stock was at $120. Today is at $14. Line ’em up: The green-energy cars, green battery companies, green solar, green wind, green you name it: They are toxic to a portfolio. Unless of course you short them. 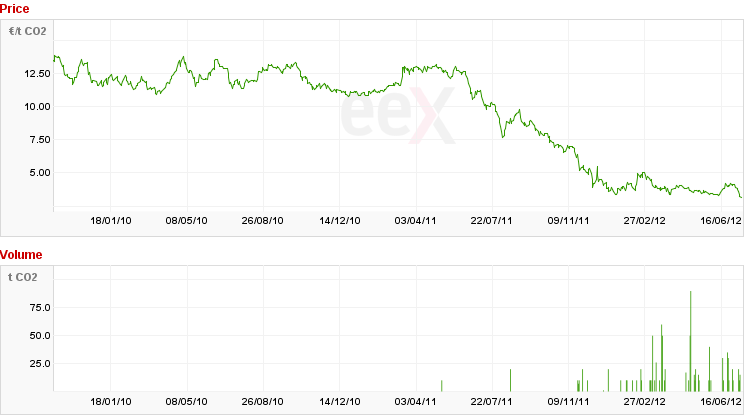 Four years ago, the Solar Index – TAN – was $307 a share. Today it is $19. The Wind Index was $31 a share. Today it is $6. Vestas Wind was $25 in 2009. Today it is $1.70. Months before President Obama made his now infamous visit to Solyndra, I wrote about how Solyndra was “not a going concern” in several papers throughout the country. I might be missing something but if CER’s & ACCU’s are both ‘money good’, then there is a ‘arbitrage’ between them. Buy at $3.80 & sell near $23. Why all the complaints? So why isn’t everybody doing this ? or are they? See the updates. The government won’t allow that obvious arbitrage. No foreign credits allowed in the fixed price Tax period where we pay $23/t. After that people have to pay the difference above to make it the same as the “floor” price set by the government. Fixed-price carbon tax for the first three years, starting at $A23 a tonne in 2012-13 (July-June) and rising to $A25.40 in 2014-15. No international carbon credits can be imported for use in this period. Carbon trading begins 2015-16, subject to three-year price ceiling of $A20 above the expected international carbon price for 2015-16, rising by 5% in real terms for the next two financial years. There will be a price floor of $A15, rising by 4% per annum. Because someone is going to be stupid enough to buy a credit off you that they could buy much cheaper overseas. Good joke! There is no implication here that the named person is acting other than legally or that the named bodies are acting irrregularly. There are other similar paper trails that show an association, which can be from informal to quite formal, between union luminaries, superannuation funds and green matter. I hope that, in time, taxpayers are not slugged to dig these people out of financial holes, should they happen. The Australian carbon tax and ETS will cost $10 for every $1 of projected savings. But the savings will not be achieved, because they depend on all the assumptions being achieved, and clearly they will not be. Furthermore, the costs can be expected to be much higher than is being admitted so far. This proves beyond doubt that Gillard is the mouthpiece for the carbon traders. By the next election, these people will effectively own Australia with the accumulated carbon debt by the nation to them. The only way out would be to go to a gold-based currency instead of a carbon one. That will wipe out the financiers but you will have to have local militia to control districts whilst the State collapses. In the US, people who will form the nucleus of such militias are already being neutralised. While the Australian Government will not recognise all types of CERs, for the most part these credits can be used as a one for one replacement with Australian permits. OK. So which ones will Australia accept? The most dodgy ones? How will we know which are the most dodgy and least dodgy? How will we know how dodgy they are? Will Julia, Combet, Christine Milne and Sarah Hansen make the decision? What level of quality control will be applied? How will it be applied in Eritrea, Ethiopia, Mogadishu and Somalia? What about here in Australia? Inevitable, at some time in the future the EU or some other country, industry or NGO will complain that Australia or some Australian firms are cheating. What level of quality assurance and what level of measurement precision and accuracy will ultimately be required for the ETS? What will acceptable for international trade eventually? I am not asking about the near term; I am asking about what the requirements will be when the ETS is implemented to the standard that will eventually be required? The major polluters CO2 emmitters getting taxed are in effect most likely paying extra on top for those who don’t. 1. Some smaller towns will have refuse tips that won’t be liable for CO2 Tax currently, while the major councils will be in effect subsiding these exempt ones! Small inefficient businesses will be in fact have a free hand in gaining ground on some more efficent businesses that will be liable for the CO2 Tax. The government in effect is creating a level playing field by rewarding those less efficient and less productive ones by simply lowering everyone to a lower overall profitability. The market could end up forcing some of these top 500 CO2 emmiters from the market place! What is the total CO2 emmissions from all business compared to the top 500 CO2 emmissions? Yes indeed. And there is an unlimited number of examples that show why an ETS or carbon pricing scheme, no matter how it starts off, will have to be ramped up over time. The cost will be enormous. 1. A farmer with 10 cows has to get compliant and be involved in the ETS. But if you have 9 cows you don’t. How is that fair? How long will that last befre everyone with a cow has to be involved in the ETS? 2. OK, but what if you have 20 sheep? Is that equivalent to 10 cows? What is the equivalence? 3. If I have 5 cows, 4 sheep, three pigs, a horse, a dog, a goat and two chooks will I be included or excluded? What if I get rid of one chook? Not enough, so how about if I get rid of the goat? 4. Woops. I have a duck too? I forgot the duck. What? I have to go to jail for cheating? Couldn’t the Department of Climate Change just harass me for 10 years like the ATO did to Paul Hogan? I realise this is not where we are starting now, with the honey-moon, rate, but this is where it will end up eventually if the whole world has to tax or trade emissions. It is clear from all the modelling that for the system to work that all emissions sources in all countries have to be included. It’s going to be a nightmare and the costs associated with the compliance will grow to huge proportions! Also what if I have x number of cows as pets – not as a business and they emit CH4 over the exempt limit? Do I pay the CO2 Tax? Same also if I have revegetated to rainforest original, on my property – can I claim CO2 credits? Do I have to include the fish in my fish tank? Regarding your application to claim CO2 credit for revegetating, you have to demonstrate you weren’t planning to revegetate anyway. If you want to claim credit for increasing the soil carbon content on you land, you first have to measure the baseline level of carbon in your soil. You need to collect samples and then get them tested. But you can’t just collect samples anywhere you feel like it. You have to get a plan done and approved. It needs to be a properly prepared statistical plan. It must be approved by the Department. They will send inspectors to ensure quality control to make sure you have collected the samples from the correct place. Accuracy of +/- 1 cm in horizontal and vertical location of every sample is required. Otherwise they may be rejected. You’d need about 100 samples from your plot. You then send the samples to the lab for testing (the current price is about $1600 per sample.) So the testing will cost about $16,000 alone. (You can get the statistical plan prepared by Michael Mann and Associates). You can get the CER info here and click on the “data” tab. carbon tax forum said “major storms intesity and frequency has increased 300% since 1960′s” or words to that effect. If this is true then the climate changers have something to crow about. If this is bending the truth or another lie ,the pm needs to be brought to a/c and exposed. That is a serious Flanneryism ! and a total load of hogwash ! Surely you must have misheard. A couple of resources for you. Ryan Maue’s Policlimate on Accumulated Cyclone Energy (covers 40 years) here – note the lack of a trend in ACE. Roger Pielke Jr on claiming an increase in weather extremes here – where the UN IPCC agrees that such statements as Julia Gillard made are simply false. One of the reasons we were happy when all of this site’s old comments got restored two months ago is because nearly every warmist talking point you can imagine has been discussed here in detail, often with links to the real evidence. In this thread we thrashed out the trend of cyclones in Australia and found… they decreased when the last warming trend began in the late 1970s. I really can’t follow the Labor Government’s numbers in any of this. We have a starting price of $23 per ton based on what reasoning? They tell us that when carbon trading is implemented we will have a floor price of $15 per ton. That’s a fixed minimum price even though Labor says they support a free market solution. In a free market – no-one would pay to emit CO2, something we all do when we breathe! Labor have been very articulate in calculating that the impact of the carbon price at $23 per tone will be $9.90 per household. They tell us they are compensating the average household by $10.10. In fact they say 9 out of 10 households will be ‘overcompensated’, or ‘better off’ under the carbon tax. But that calculation was done when they had no idea who would be paying the carbon tax. They thought it would be about 500 of Australia’s ‘biggest polluters’. It turned out just 294 enterprises will be paying the carbon tax immediately. So how good are Labor’s calculations? This first tranche of carbon pricing is only targeting a reduction of carbon emissions by 5% on 1990 levels by 2020. It is Labor’s policy to work towards reducing carbon emissions by 80% by 2050. Treasury estimate this will require a carbon tax of $275 per ton in 2010 dollars. I’m not sure how they figured that out given they didn’t know who would be paying the tax? I do know Treasury’s calculations assumed the rest of the world would join Australia in pricing carbon at the same level by 2015 but there is no sign that will be the case. What does that do to Treasury’s modelling and the Australian economy? When is the government going to tell us? Better still, when is someone from the main stream media going to ask the question? The government’s household compensation package is based on a carbon price of $23 per ton. They have not announced any intention to increase the compensation package even though their own models indicate the carbon price will need to increase by 1,196% in real terms to achieve their stated goals. When will the Government address this issue and if they do, how will they possibly achieve a budget surplus? Read the fine print. The 5% reduction is from the anticipated increase; in other words they expect emissions to go up by 16% not 21% without a tax. They are not expecting any reduction in emissions for 30 years, and actual reductions (on current levels) will require a carbon tax (or equivalent) of $135 per ton. A. Will dumping 89 million tonnes of cyanide tailings into the ocean cost anything? B. Will dumping 89 million tonnes of CO2 into the atmosphere cost anything? B. Cost is $2.047 Billion! Which is environmentally worse? A or B. The man that has done A. also introduced the proposal that resulted in the answer for B. Yes. That’s a very valid connection. There is lot about the ‘A’ matter that has not been exposed yet. As in “You scratch our back and we won’t tear open yours”?? Okay, okay, I only wish the reality were so exciting. If the MIBs come after me I’ll know I guessed correctly… about something…. Perhaps what you should be more angry about is the mendacity and deceitfulness of the mainstream media, who cling by their fingernails to their self exalted status as the guardians of their truth and faith. Where would the Gillard government be if the general population were given all the facts. I believe it’s quite rare to find a democratically elected politician who rewards his or her electorate with honest and transparent conduct that vindicates their election so you sort of expect to be disappointed. Your government defies belief, taxing a life sustaining, naturally occurring chemical compound on the grounds that they are saving and preserving life!!. The only reason I believe that Aussies are not marching on their Parliament is because they have been duped by their media, and the tribal behaviour of those whose blind faith in their brand will not be turned. When all of this is behind us we’re going to have to rewrite the rules to the effect that honesty, integrity and veracity are the ultimate arbiters of truth. In terms of the media this means I don’t want to read some third rate editor/journalists’ political viewpoint thinly disguised as fact. On the bright side I believe the silly buggers have underestimated us. We are more than just an annoyance now. The EUA’s are serialised – each certificate has a unique number and is listed in a register. This means they cannot be directly traded at all, by anybody. What you can do however, if you have excess EUA’s, is exchange them for UN CER’s, at a rate, and then onsell the CER’s to somebody else, who can then repurchase brand new EUA’s with them. EUA transactions are not taxable within Europe. But some enterprising people started trading EUA’s for CER’s in France and Germany, and then selling the CER’s for EUA’s in Britain, and charging VAT on the transaction. So we are knackered Rereke is what you are trying to say. You live in a parrallel universe Team Smith. California and New York are bust! EU is bust. It aint gonna happen. For Christsakes wake up and smell the roses!! If I get on the I10 (interstate highway linking California and Texas that goes through Arizona) the first thing I notice is all of the the UHAUL and other move your self trailers are headed East, very seldom do I see any of this traffic going West once I get out side of the Phoenix metro area. People are voting with their feet, those with good job skills are leaving California in droves leaving the non-producer welfare recipients behind, what do you think is going to be the result? The collapse in the European carbon price comes as no surprise. I suspect the collapse has been led by Germany following the defection from the warmest camp of Professor Fritz Vahrenholt, a renewable energy expert and a founding father of the modern green movement in Germany. Together with geologist/paleontologist Dr. Sebastian Lüning, he co-authored the book “Die kolde Sonne” exposing the IPCC for ignoring mush of the climate science, for overly exaggerating the impact of carbon dioxide on climate and demonstrating why there is no coming climate catastrophe. Congratulations, Australia. What did you think would happen when you voted for a venal, power-hungry, socialist, career politician who had never held a real job? It’s not as though you couldn’t look to the US to see what the consequences of that choice would be. At least you won’t have to worry that you can’t afford to drive to work, because, before long, all your jobs will be gone. Maybe you can live on the lollies that the unicorns bring you. Smile and wave at the drones that you buy with your tax dollars and will soon be seeing overhead and reflect on how unions = new-world-order international socialism, a.k.a tyranny. I think this article in the Australian yesterday says it all about the stupidity of carbon trading. 1. Dr Moore said there was potential to make money through the trade of carbon credits during cattle grazing. To do so, he said, cattle stations must be divided into small paddocks using fences, forcing stock to graze intensively in smaller areas during shorter periods of time, before being moved to another paddock. So they get a cattle station which has not been stocked with cattle for several years and has therefore not been creating any cattle methane emissions. They stock it with methane emitting cattle, also create carbon emissions putting up fences, running vehicles, keeping horses and so on. And then they claim carbon credits for only grazing areas every 5 years. That makes total sense???? So they burn land – which wasn’t being burnt before – and pick up carbon credits for that too! This is how ridiculous carbon credits and carbon trading is! I seem to recall about 10 years ago, that Australia paid some body of the UN (can’t recall who or what) a very large fine because Austrlia had suffered several bush fires that year. I seem to recall it was the Canberra bush fires. I remember being stunned that the locals had their houses burned down, and our government gave money to the EU as compensation for the CO2 emited. When KRudd was in power the government comissioned a study to determine the viability of turning our northern lands into a food bowl, tey came back and said you would need to build a dam to secure water during summer but we cannot build any dams (greenies wont let us) so in teh end they said the abbo’s should just grow trees on it and make a killing from the soon to be legislated CPRS. This is what this stupid tax does it destroys one productive industry and replaces it with a non productive one which makes money not products. Layman from the USA here. Could someone please explain, even if the carbon tax was 100% efficient and man made CO2 output was reduced to zero (you all died tomorrow), just what affect would that have on global temperatures or Australian weather? Would the current 393ppm CO2 drop at all? Indeed, despite the challenges, super funds in Australia have shown a desire for exposure to clean energy assets. Industry Funds Management owns Pacific Hydro on behalf of the industry super funds, VicSuper seeded the Cleantech Australia Fund and REST super is a cornerstone investor in a major wind farm development in Western Australia. Mr Oliver (ACTU secretary) also called for the government to help boost fund’s investment in clean energy. Every home will pay £88 to build a vast network of pylons in a £22billion project to link wind farms to the national grid. This wider scheme will also be funded by higher bills for families and businesses. The network of pylons is expected to trigger disputes amid fears that beautiful views will be destroyed. Ofgem has said £470million should be set aside to bury cables in sensitive areas, such as national parks. (Ann Robinson, director of consumer policy at comparison website, uSwitch.com: ‘Already over a third of consumers say that household energy is unaffordable, while more than eight in ten rationed their energy use last winter because of cost. Jo-is there a mention of “free” markets or just markets? Basically the argument in 90s until now is that markets prevailed so we need to manage them to create an appearance of capitalism. Instead we are back to Corporatism among the politically connected cronies or Big Business. The actual template we see repeated references to is Govt/ Big Business/research u’s redesigning and managing the economy around the idea of not using natural resources any faster than Gaia can replenish. Which is why small businesses making consumers happy without relying on favors or the Goodwill of the state authorities seem to have a target on them all over the West. Especially in the “You didn’t build that” US. Very god point Robin. They say “market” – we think “free market”. It is yet another case of the terminology being used to obfuscate the meaning. Very god point Robin. They say “market” – we think “free market”. I strongly doubt you believe in free markets for all goods and services. OT – but relevant to some of your comments. Please read the attached short article which graphs current Government, Commercial and Household debt levels vs Sustainable debt levels for each category. Note that Financial debt levels – due to the difficulty of measuring them are left out of this article. I offer this to you in good faith as you seem to be blissfully unaware of how indebted the developed world is – and yet you seem to expect the developed world to carry structural malinvestments such as the Carbon tax/ETS (and such schemes) and just keep moving forward. The real threat to the ongoing operation of the Carbon Tax / ETS is the likely collapse of the developed world economy. In such an event – anything that does not work will be ruthlessly done away with as societies attempt to survive. Try me Adam. I probably deserve the “Adam Smith” nom de plume more than yourself. The BBC employs the TV and radio presenters through ‘personal service companies’ that allow them to minimise contributions to the Exchequer. The deals also allow the corporation to sidestep millions of pounds in national insurance. Six top BBC presenters earned at least £1million last year. 16 of its ‘top talent’ earned at least £500,000. In a grilling by MPs yesterday, BBC finance chief Zarin Patel admitted that 148 of the broadcaster’s 467 presenters – nearly a third – were paid ‘off the books’. Meanwhile, the BBC’s annual report yesterday revealed that more than half of all BBC2 shows are repeats. btw wish someone could explain why we have to pay a fortune to Foxtel each year just to be able to watch the tennis, when almost every channel is showing repeats of the same mindless rubbish year after year. worse than first reported. wonder if similar could be happening at Auntie ABC? The figure represents just over one in 10 of the 3,000 BBC staff paid through service companies. Of that number, 184 who work on-air were paid up to £100,000, 67 between £100,000 and £150,000 and 91 more than £150,000. Zarin Patel, the BBC’s chief financial officer, only disclosed the number of presenters – 148 – who were paid through service companies under sustained questioning by MPs on Monday. Last night, Margaret Hodge, the chairman of the public accounts committee, said: “Clearly we have not got to the bottom of this saga. The BBC has now promised to do a complete review and we will come back to it when we see the outcome of that review. “No-one has to arrange their financial affairs so as to pay the maximum amount of tax”. UK Court judgement (and similar one in the USA). So if there is to be an investigation into BBC employees, will this be extended to politicians, UN employees, members of Government Boards and Quangos? Rearrange to get well known phrase – Worms – of – can. Thanks Crakar; just what I suspected. I thought you might appreciate the can full of worms picture. Any lifeline European Union regulators throw to the bloc’s own troubled carbon market may do little to help the United Nations’ ailing emissions offset scheme. The EU emissions trading scheme and the U.N.-backed offset market have been in an interdependent relationship since 2005, particularly since most of the demand for offset credits comes from the 12,000 or so big polluters in the EU scheme. Both markets are flooded with supply. The European Commission is expected later this month to propose to fix its oversupplied market by delaying the sale of up to 1.2 billion carbon permits for several years. Such a proposal could help buoy EU carbon prices from near record lows in the near term, but it may not be enough to help U.N.-offset prices from sinking, analysts said on Tuesday. Already there are signs of decoupling. Benchmark prices of EU allowances (EUAs) are trading around 4.45 euros above the benchmark U.N.-backed certified emission reduction (CERs), a level not seen since February this year. Benoit Leguet, head of research at CDC Climat, a subsidiary of French bank Caisse des Depots: “The price of CERs and that of EUAs have very different dynamics,” he told Reuters in an email. The European Commission will on July 25 debate a legal framework to revise the timetable for auctioning carbon allowances to bolster prices on the EU’s weakened Emissions Trading Scheme, a document seen by Reuters showed. EU sources said in June draft proposals looked at the possibility of delaying the sale of anywhere between 400 million and 1.2 billion carbon allowances. Kumar said even 1.2 billion allowances would not be enough, favouring instead “anything in the region of 2 billion”. Prices on the EU ETS hit a record low of 5.99 euros per tonne in April. They have recovered to above 7 euros, helped by the anticipation of action to support the market. The EU parliament and some sections of industry have called for urgent intervention, arguing the ETS is too weak to provide an incentive for investment in low carbon energy. Others say an increase in the carbon price would be a burden in difficult financial times. Equally, while many governments are keen to provide support for renewable energy, Poland, which is reliant on carbon-intensive coal, has been at the forefront of opposition to anything that would drive up the price of ETS allowances. “The ‘backloading’ proposal is probably buying time until some economic improvement in 2-3 years, which will push up demand and production,” Graham Van’t Hoff, executive vice president of CO2 and alternative energies at Royal Dutch Shell. ‘The problem faced by Hughes, as with any objective individual, is the sheer immensity of the IPCC ‘consensus’ fraud. If you tell a layman the facts they recoil, thinking ‘But I have been told this by scientists such as the Royal Society’. 1. The models pluck 40% extra energy out of the air than is put in. This is done by assuming incorrect boundary conditions, expressed in Houghton’s highly-flawed treatise. The net effect is to increase IR warming by ~400%, biasing heat transfer to radiative hence exaggerating dramatically the effect of additional trace CO2. In reality, from fundamental physics, there can be no CO2-AGW. Yes, I’ve said it. 3. There is a well-organised deception on sites like this in which politically-committed scientists deflect criticism of the false science by portraying genuine enquirers as either ill-informed, politically-motivated or intrinsically evil – the ‘denier’ epithet, devised in 1989 by Al Gore as a political ploy. How soon after Gillard’s “reversal” on the Carbon Tax did the “independent” (yeah, sure !) remunerations tribunal award that major pay increase to parliamentarians? Was it back-door way of paying her and her slimebags for bringing in the carbon tax? Mr. Abbott accepts the pay increase as well, and still “believes”.. or appears to.? Who pays the tribunal, and are their skeletons in the tribunal’s bank accounts? Looks like this ignoramus global warming NUTJOB graham readfearn (you remember him, the one who embarrased himself attempting to debate Lord Monckton, failed miserably and got the sack from his Courier Mail Green Blog) is at it again. He is bemoaning the fact that basically nobody is listening to the global warming FRAUD & LIES anymore. Let me play a song for him on the world’s smallest violin !! LOL, the Brisbane time wouldn’t just happen to be catering for the one or 2 seats that Labor won in the Queensland election. Inner city latte nonces. The reader comment show a distinct “brainwashed” lack of quality. Looks like one of the Fairfax papers on the way down and out. And given the many appeals to authority, ad-hom and poisoning the well logical fallicies in his own post, he would not be able to distinguish lysenkoist style pseudoscience from the real thing. He is almost certainly describing a large proportion of his few regular readers. The inner city, latte sipping, alternative medicine.. etc crowd. But that is the world this fool lives in. It is all he knows. Just checking to see if I have been banned in this thread too. How appropriate is that ! A bot recognises another bot. I hope that you have not been banned – I have a few comments for you to address “up the thread…”. I am curious as to your responses. The Carbon Tax is about encouraging the right behaviours. You see, it’s about hitting the high income earners, taking their money and handing it to the lower income earners so that they can spend it at the Pokies. Then, when the lower income earners get hit with the higher costs, they can divert money from their food budget to pay for their power bill. Of course, they can leave the smokes and the booze – after all, we don’t want to be seen as knocking these guys do we? I can’t wait to join the low income earners. As a side note – What would be the most efficient way of releasing the maximum amount of C02 in the atmosphere using cheap substances? I want to film it as a protest. Maybe something that can allow me to release enough C02 equivalent to what a small town might have “saved under the great carbon tax Grab? I was thinking of the Baking Soda and Vinegar trick, but there must be something much more effective – Any Ideas? There, encouraging the right behaviours – JuLiar Guilleard style. Dry ice in swimming pools will give them a blast! Don’t even consider the fertilizer and diesel trick – pure carbon release! Sorry, but dry ice in a swimming pool is only releasing back to the atmosphere CO2 that was (mostly) derived from it in the first place. In other words, basically carbon neutral. You REALLY want to make a stand and get up the Greenies’ nostrils (figuratively and literally), build a bonfire out of car and truck tyres. Recycling Tyres into the atmpsphere – now that sounds excellent. Does anyone have any ideas on how much greenhouse gases will be released from an average car tyre being recycled? Why does it come as no surprise that there is support here for burning old car tyres as some sort of random protest against the carbon tax. PLease do it in your loungerooms. The burning of cars tyres is a symbolic gesture MattB you know like when a local council jacks up the fees and charges across the board in a vain effort to stave off bankruptcy. You watch as the recession digs in you will apply this symbolic gesture to the people that voted you into office. The burning of car tyres will increase as people try to stay warm as they will not be able to afford heating though this will no longer be a symbolic gesture of course. In an effort to reduce the amount of tyres burnt i suggest you inform them of your tip about wearing an extra jumper (largely symbolic of course)but be warned you may get another symbolic gesture in return. Why does it come as no surprise that there is support here for burning old car tyres as some sort of random protest against the carbon tax. MaatyeeB, you wouldn’t understand the various Laws of Unintended Consequences. We’ve tried to warn you about same but you were ….um not able to…..get it. PLease do it in your loungerooms. Yes, good advice IF you have full insurance. With the carbon tax effects of depressing economies, a good insurance claim might permit shedding a huge underwater mortgage debt. Mattyb says tyres are out – back to Baking Soda! And now we’ll have tonnes of the stuff! New technology makes baking soda from coal power stations CO2 emmissios! Victorias coal power stations alone pump out 6645 megwatts -so they will have a stock pile of 113,427,997 tonnes of Baking soda spare at the end of each year! Chinas going to have heaps of the stuff! You could add acid to that and return the CO2 to keep things from cooling down to the point you require a jumper! Brown: Is it too late to put a tax on baking soda? Seriously Dave have you got a link for that? Skyonics is the company that’s going to make enough baking soda for the entire universe demand by bakeries! Baking Soda to Curb Global Warming! The problem is for Victoria alone you’d need about 43 million tonnes of sodium hydroxide and you’d need more energy to produce the sodium hydroxide than all the power plants you’re trying to clean up????? I’m off to buy another truck – they’re going to need nearly nearly 11 million trucks to haul the baking soda – and then what about all the cakes that will bake – more trucks! Now all they have to do is find a way to capture the power plant exhaust and take out just the CO2 ….. at the same rate it is being emitted. Earth hour day is my contribution day to the plants of the world. My property has of recent times had the never to be seen again rainfalls. The trees coming out of drought with the extra CO2 fertiliser have grown like topsy. Many committed suicide by being a tad top heavy. Thus I make the mother of all bonfires, but Lo they are not in state for burning as they are some what green, I use an accelerant of truck, tractor and car tyres, these are ignited by my collection of sump oil for the year that is prodigious, the initial flame is a litre of petrol ignited by a flaming spear. Perhaps I qualify as a small town, my bonfire nights are special but I do miss the fireworks of my youth. One day my contribution to the health of Gaia will be applauded. Good evening Jo. Is there any chance your footage from the ABC documentary “I Can Change Your Mind About Climate” will see the light of day. You hired your own personal camera man to take footage of the event. Is anything going to transpire from this? I would really like to see what was edited out from the ABC with your dealing with Anna Rose. Jo is there a place on this site for suggestions? This thread deserves another shot for prominence. Please re-post it. All comments got lost. Thanks for the response Jo. Appreciated. I overlooked the cached link. Why dont my comments appear is it broken again? A list of major bank fraud in recent years (mainly USA). WOW that means investors think there was a heck of a lot of very bad mortgage securities that were packaged and sold and they want their money back along with some fines and are willing to spend a few million to pay expensive lawyers to sue for it. …part of the Abmac suit filed last January showed PricewaterhouseCoopers tried to stand up to JPM/Bear accounting tricks before and the bank just ignored it. …Awareness of how these Wall Street titans cheated and stole damaging free markets was a result of investigative journalism and the PBWT attorneys not our regulators figuring it out first. ALP as far back as when Keating was in govt wanted to price carbon pollution , John Howard wanted to as well , Rudd did and even Tony Abbott wanted to price carbon with a simple tax in his own words…..So any person with the smallest IQ has known pricing carbon has been in the works for last 20 years so it is no shock..
Justin what parallel universe do you live in? What Howard said is that he would only move to a carbon trading system if the rest of the world did. He did not see any reason to harm our economy for no benefit. Is that all you have only 15 seconds of a 3 minute interview or is that all you want to show because the resat after that she say SHE WILL price carbon in next term.. So in fact you have confirmed the lie / propaganda on this whole debate by cherry picking sections of a interview ..
And he actually said he wanted a Cap & Trade system for Australia before 2007 election nothing to do with rest of the world you can easily find this on on the internet ..
Sure Justin. Gillard promised us a “community consensus” in 2010. Remember the 150 people selected from bus stops for a representative committee? If a politician can say “There will be no X under a government I lead” – then they bring in X, there is no other word for it than “liar”. No one forced her to make a deal with the Greens. She didn’t have to break that promise. There was no gun to her head. Try this on: I will* pay you Justin, $1000, if you send me $50. *”will” means “as practised by the Gillard government”. Sorry Jo 19 legislated clean energy bills passed in Parliament and signed by Queen but not a single mention of it being a tax that is the actual law so infact nothing was broken as you like to make out.. It is called a fixed price ETS or the Clean Energy Legislation that contain TRADE-ABLE permits … Even in basic high school economics you are taught what is a tax .. taxes DO NOT have permits or other items of trade..
Who said that before the last election Justin? Hint: Initial WS. You mean facts, like just that one piece of evidence that Jo keeps asking for Justin ?